Everyone is talking about Zombie Orpheus's upcoming adaptation of Jack Chick's "Dark Dungeon". Hell, I'm one of them. However, with all this attention being thrown at the newest work of the people behind "The Gamers" another piece of exciting news has been completely overlooked! The streaming release of Dead Gentlemen's fisrt (to my knowledge) affair with movies: Demon Hunters. 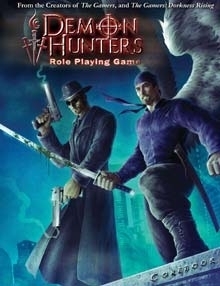 Yes Demon Hunters, the movie that spawned a really good MWP game that can still be found to this day! Seriously, watch this. The humor is spot on and if you want to be really savvy watch in this order: Demon Hunters, The Gamers, The Gamers 2: Dorkness Rising*, Journey Quest Season 1 and finally Gamers 3: Hands of Fate. Just watching the growth of production is amazing.